1) New residential development including 2-4 story waterside apartments and 2-3 story family townhouses. 4) Canal widening to provide moorings and associated car parking by relocating the former footbridge. 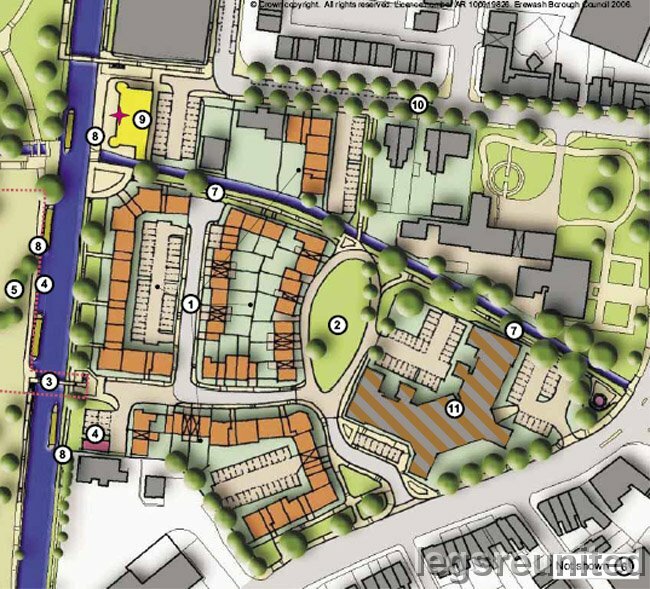 5) dotted line is prop site of mooring basin and road bridge replacing footbridge. 7) New footpath along Golden Brook. 8) Improved towpath and public open space. 9) New landmark waterside restaurant. 11) Former Long Eaton School converted to provide workspace and community / training facilities. For full description see PDF download.